Grundfos SCALA2 domestic booster pumpoffers constant water pressure regardless of tap quantity or time of day. The KSB Group has officially opened a new service centre in Abu Dhabi. Japanese drainage pump manufacturer Tsurumi has relocated its European headquarters to a larger facility in Düsseldorf, Germany. Pentair has committed to opening two application centres to help municipal, industrial and commercial companies better manage water resources. KSB’s newly developed free-flow impeller for wastewater pumps will be at this year’s IFAT in Munich. Dragflow has delivered a remote controlled dredge (DRP18) to a chemical industry dredging project in Italy. Sulzer has named Christoph Ladner as head of Group Communications & Investor Relations. The Solenoid metering pump Beta b from ProMinent is designed to meet the requirements of modern water treatment and chemical metering. Ebara Corp has donated pumps to the Institute of Technology of Cambodia (ITC) as part of the Japanese company’s international cooperation activities. Ruhrpumpen has opened a new sales office, design centre, assembly and pump testing facility for reciprocating plunger pumps in Lancing, UK. Xylem recently announced that Flygt SmartRun’s cutting-edge pump cleaning function has won the 2016 RIONED Innovation Award. 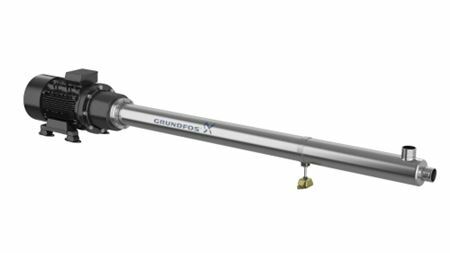 Grundfos Group has reported substantially increased earnings and moderately higher sales for its 2015 financial year. Mark Rajkowski has been appointed senior vice president and chief financial officer (CFO) of Xylem Inc.
ITT Corporation recently announced that its Bornemann brand has launched the SLH-4U, a new type of the SLH series hygienic twin-screw pump. Ebara Machinery Zibo Co Ltd has shipped new model double suction centrifugal pumps to a chemical plant in Fujian Province, China. Caprari has earned the maximum rating from CRIBIS D&B for its financial reliability. Almatec®, part of PSG®, a Dover company, is pleased to announce that its plastic and metal AODD pumps are now 1935/2004/EC-compliant.